Fashion your move in and around Chelsea with elegant style befitting any Sloane. Providing a man with a van service for London's finest and trendiest district, we are an ideal transportation solution all round. We offer a traditional carriage service exclusively for all your personal or business belongings. When in need of relocating anything too big for a car or even dare we say a Chelsea tractor any distance to and from Chelsea SW3,we have smart vans with even smarter drivers willing to assist you along the way. We help with loading / unloading or if you prefer a more bespoke service then why not let us take care of all the shifting with an additional man supplied by us. We are happy to work under instructions on behalf of Landlords,Estate agents or Property management agencies for all matter of tasks including the relocation of furniture, beds and white goods. We can offer flat pack furniture assembly or disassembly too. If you are residing in a house, flat or shared accommodation then our manned vans are what you need to get your move going in the right direction. One of our van men can be with you at a moments notice on a good day but be sure and avoid unnecessary disappointment by booking well in advance. From Sloane Square to World's End we got Chelsea covered seven days a week. Chelsea has a rich and diverse history, has been and is still home to all manner of people from all walks of life. It's easy to see why the area is one of London's prime property locations within easy reach of the center of town. Take a drive or walk along the Kings Road and you may be forgiven for thinking you are in the West end of London. Here is a shoppers paradise with department stores, designer shops, restaurants, bars and some very exclusive clubs. As a guest I have been privileged on a number of occasions to visit The Chelsea Arts Club were members can meet and make good company amongst their own fraternity over a drink or a meal. For the more sporty types then you are certainly spoilt, Chelsea football club resides close by at Stamford Bridge and arguably is one of the finest teams in Europe with the silverware to prove it. Heading down the Kings Rd away from Sloane Square and just pass were Gunter Grove intersects lays Lots Rd. Here you may find one of our man and vans delivering or collecting antique furniture at one or two of the auction houses. 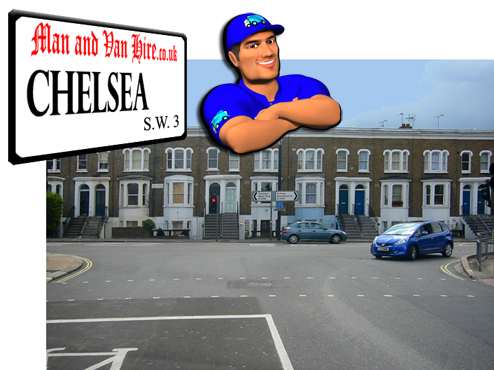 Just an other reason why a helpful man with a van in Chelsea comes in handy when you need a quality removal service.